The very first digital product I ever purchased was after I signed up for a free webinar. I had no intention of buying a product, I just wanted to consume the free information. I sat through the whole thing, the info was excellent but the upsell was even better. 3 years later I have learned a lot. I have attended some awesome webinars with fantastic info and some okay webinars that were pretty basic. The thing is, webinars have the potential to convert like crazy. If you are selling ANYTHING online, you need to consider a webinar. I know it can seem a little intimidating, especially to put yourself out there in a live way where people can comment and ask questions. But trust me, it can be so rewarding. First of all, what is a webinar? A webinar is an online conference in which you teach something to a group of people that sign up ahead of time. It is usually live and can contain some awesome info. You won’t want to give all your info away for free though because most webinars have an upsell at the end that leads to the sale of your main product. Generally, people attending the webinar are able to interact via comments and they are able to ask questions. This is a great way to sell your product because you can directly address any concerns your potential customers may have. This also allows you to make an offer they can’t refuse. So how do you nail your first webinar? That way, you can refer to your product throughout the webinar to get people excited about it and when it’s time for the upsell they are already sold. You are really going to want to promote your webinar well. Generally about 1-2 weeks prior to your live webinar, set up a facebook or Pinterest ad that is targeted towards your ideal client. Promote it in relevant groups and share threads. Post it on your Facebook page– really talk it up (but don’t spam people, of course). You can even promote it on your blog and through your email list. Don’t be afraid to promote it through your newsletter. Just because those people are already on your list doesn’t mean they won’t become buyers or tell their friends about it. You can even offer a referral link and let them know if they have their friends sign up, they will be entered to win a prize (which can be anything from a free consult to a free product or gift card). The best webinars I’ve seen are mostly slide decks mixed in with some live video. I don’t like live video (although I know it’s totally necessary to grow my business). I think I look super awkward and nervous, which doesn’t come across great. If you feel awkward on video, you will want to really make sure you nail your slide deck. Slide decks are basically slide shows that go along with the webinar content. Powerpoint is boring and basic. Using Canva can really bring your slide decks to the next level. I can’t even tell you how much I love webinars with worksheets. 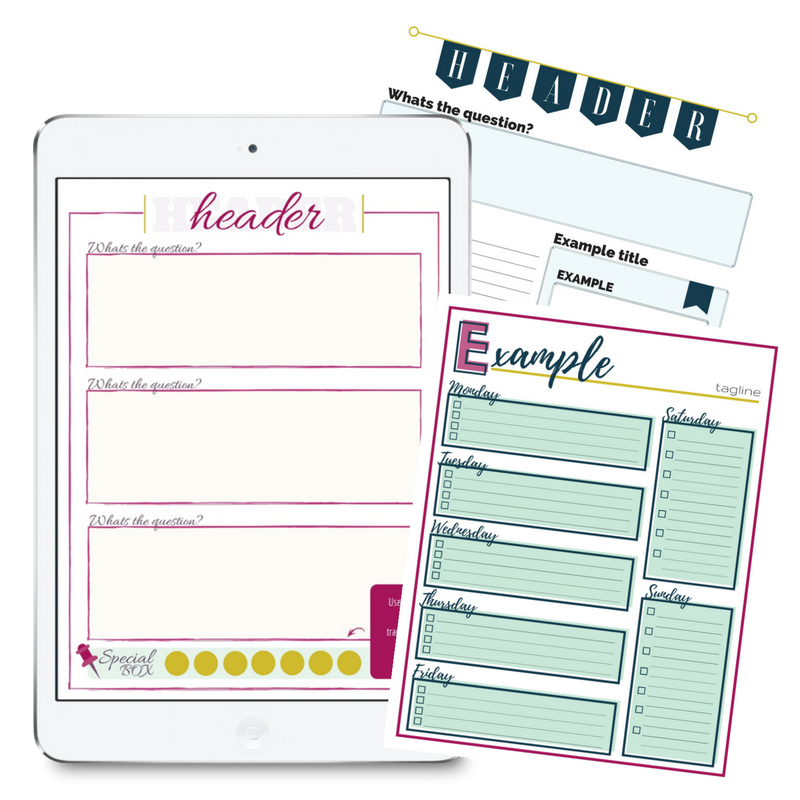 Usually, the worksheets are fill-in-the-blank style and get the reader to pay extra close attention along with allowing them to take notes. It gets them more engaged and involved in the training. These don’t take long to create and again, can be easily created in Canva. Taking this extra step will absolutely give your webinar a creative edge. Really take the time to answer each and every question during your webinar. Answer them as you go but also set aside time at the end to answer questions. Do this after the upsell offer because this is likely when you will lose some people (plus this gives them the chance to ask questions about the actual product). Don’t underestimate the importance of this step. This is where you get the chance to convince people that are on the fence that your product is exactly what they need. Step one is transitioning from the swaddle. This is important because at a certain age the swaddle not only becomes a strong sleep assciation but once the child starts rolling it can become a saftey concern. However, many parents really struggle getting their kids to transition smoothly. I actually go into amazing detail about this in my ebook. I discovered this incredible technique that worked almost immediately on all three of my kids! You are giving them the step and the reason why it’s important but leaving out the technique (but mentioning that you have the technique available in your ebook). Your potential client’s interest and curiosity are piqued. They are excited to learn your technique. But you can take it a step further. Offer an incentive. Remember that digital product I mentioned earlier? I purchased it because it was not just the membership site (offered at a lower rate if the entire year was purchased at once) but they also offered a free consult and website review to the first 5 buyers. You can do this. 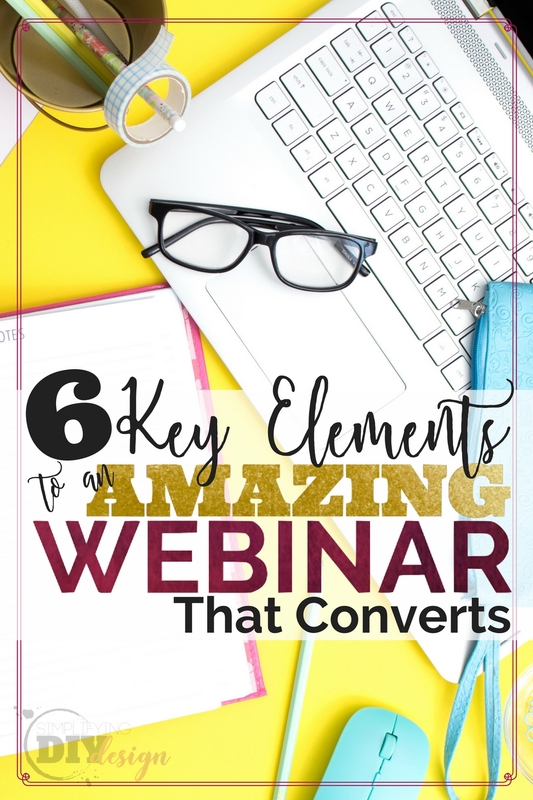 You can create a webinar that converts like crazy. Your first webinar will be nerve-wracking, I’m not going to lie to you. But when you see those sales start rolling in, you’ll be hooked. Just remember the 6 key elements: The topic, targeted Facebook or Pinterest ads, a killer presentation, engaging worksheets, answering questions, and the irresistible upsell and bonus offer. Print it off and laminate it (or put it in your blog binder). 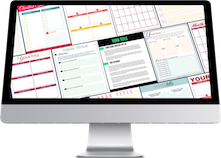 Use it each time you organize a webinar to really make sure you knock it out of the park! To get the password to our protected library, just fill out the form below! 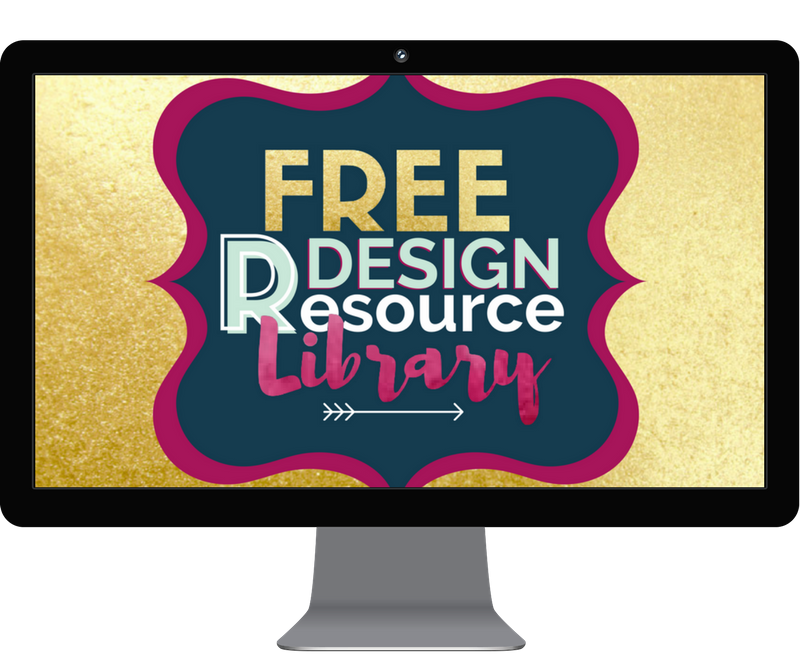 Find this checklist in our FREE design resource library! 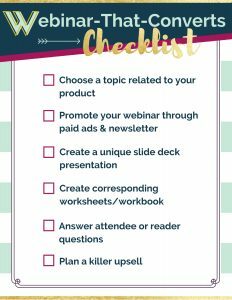 Get access to this checklist, plus all of our free canva templates, tutorials, and design tools that will help you start rocking graphic design for your blog when you sign up for our email list! Sign up below and I'll send you the link + password! We haven’t delved into the area of webinars yet, but we are creating our first course and I think this might be a good way to promote it. Thanks for all your helpful suggestions. You make this sound like something that we could manage. 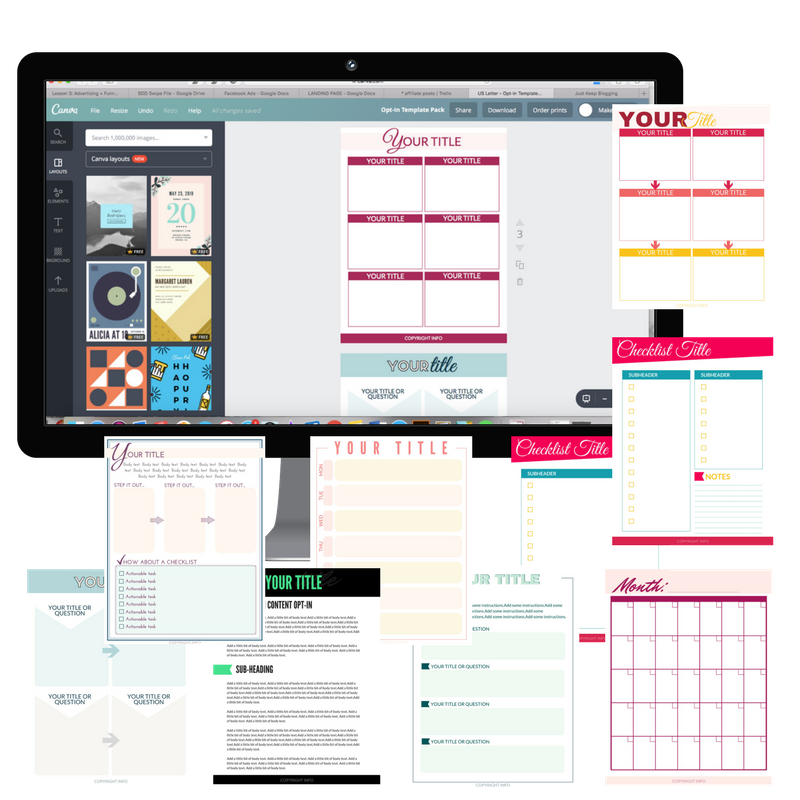 I just went through a product launch and highly recommend doing some kind of free training/webinar- it really helped me exceed even my stretch goal and also helped me give my email list a huge boost! Good luck with your first course!